wan life to live: i'm still here, i promise! it's been a cah-razy day. first, i had to throw together the taxes (i HATE this crap. we should totally just convert to a flat-tax kinda thing), hunt for an envelope and then a stamp, and by the time i was done i had about 25 minutes to jump in the shower and be at costco to meet my friend MommyBelle & co. for a stroll and some cheap lunch. a zillion errands, a stop at the park, and running through the grocery store rounded out our day. and now i'm tired! thank goodness i put dinner in the crock pot. i had another corned beef brisket i'd planned on making for the teen, but of course that's a non-issue now. so that'll be dinner tonight. yum! "mum!" 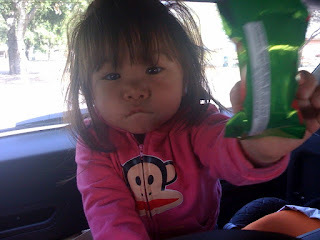 she shouted, brandishing the snack. "mum!" and then she made the sign for "please?" yes, the bean thinks she's british. i get "mum! mum!" all day long. it's comical. she also says "wuf!" when she sees a dog. and "buuuu-bo" at the sight of anything resembling bubbles. when she sees the hub: "daaaaaad!" i've got to get all this on video before she switches over from speaking greek to actual words. i wonder if i should even bother to recap the weekend at this point. i guess i should - there are some fun easter pictures to share. there's always tomorrow. 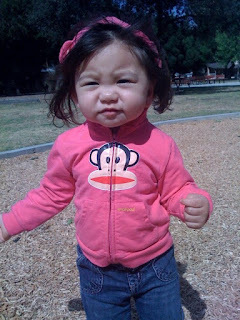 One of these days we should take a picture of both of us in our Paul Frank zip hoodies. and can I just say..."Yay for costco hot dogs!" I was a faux-Brit too, addressing my mom as "mummy" until I started school. I did manage to pick up a ginormous box of pound cake! what a cute little monkey :-)! glad you're still with us!!! How come the Bean says "daaad" and not "faaaaather?" I love that she climbed all the way to the back and found the treats. what a little stinker! God she is so damn cute! Seeing as I'm the queen of posting things days late, I say go for it! Oh man, I love that hoodie pic.